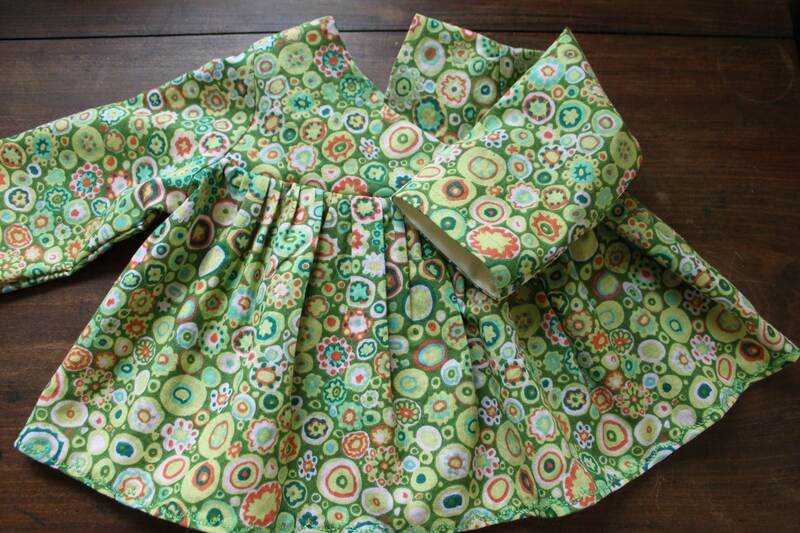 This week I’m making baby dresses. I got this book “Making Baby’s Clothes: 25 Fun and Practical Projects for 0 – 3 Year Olds” by Merrett from Amazon.com recently and was so happy when it came. The reviews had been pretty good, but I would never have purchased a sewing book without being able to see the list of patterns or at least a nice sampling of them if the book hadn’t cost less than $8.00. At that price I decided to buy it based on its 4.5 stars and hope for the best. It truly is such a great bargain; the patterns are very cute, the pattern pieces are reasonably easy to trace (they are full-sized, and although they overlap they are easier to see through the tracing paper than the patterns from other much more expensive sewing books on my shelf), and the instructions are clear. 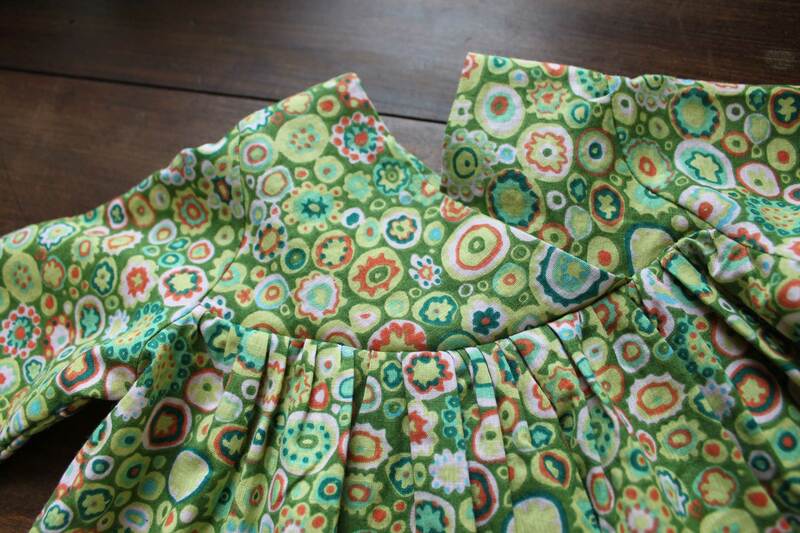 This little dress was my first project from this book. It’s 0-3 month size and it looks like it will actually fit a newborn, unlike many commercial patterns I have sewn that look like they’ll actually fit a nine-month-old. I made it for the new baby to wear with a sweet pair of blue longies knitted for newborn Worth by a friend of mine. I don’t have any problem putting girl babies in blue, but I thought that making a dress specifically to go with the longies would make them special all over again and thwart annoying people at the supermarket from calling my girl baby a “he” at the same time. This close-up shows how the neckline is constructed. The overlapping panels are the same on both sides, and will be cute and (I think) easy to get on and off over baby’s head. I stuck to the pattern instructions pretty faithfully, except I turned under satin ribbon to make the sleeve hem so they’d be soft on baby’s wrist and just a nice little detail. This dress is from the same book. 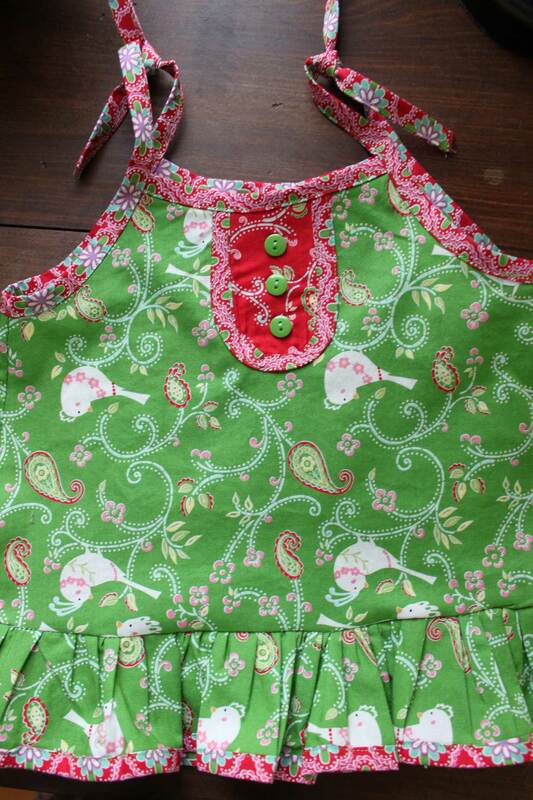 It’s intended as a summer dress, but I’m thinking my newbie will wear it over a plain white footie or maybe a long-sleeve onesie. The fabric is extras from her crib bedding, which I have yet to show-and-tell because I still need to finish the matching mobile, but it’s this along with some coordinating prints and it’s so sweet. 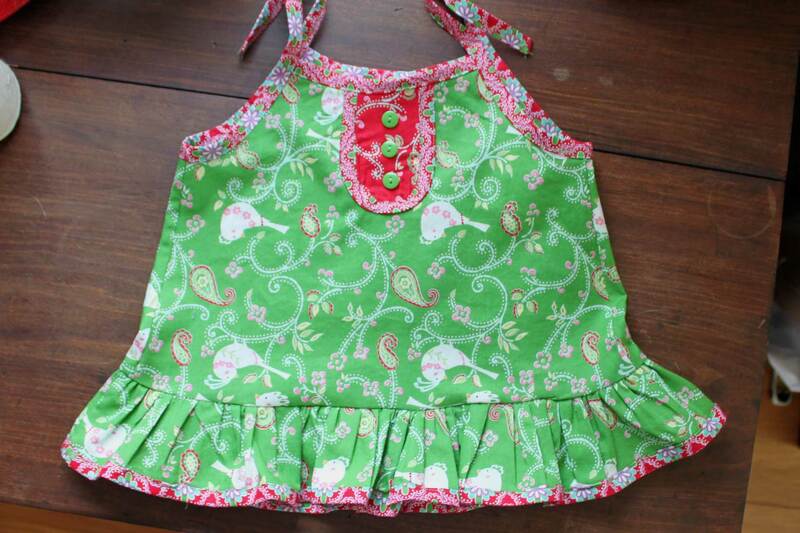 I’m thinking this little dress will be cute around Christmastime (it’s 0-3 month also) without being overtly holiday-themed. Here’s a better photo of the fabric and the front placket. Can’t wait to see these in action!